The Thanksgiving meal is really a gastronomical walk down memory lane for many of us. 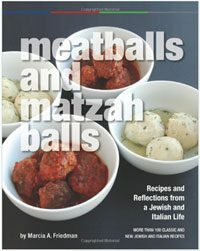 It’s less about the latest, most innovative or exotic concoction (though those can be fun, too) and more about creating and savoring the best renditions of favorite recipes and flavors from years past. At many tables, the feast wouldn’t be complete without a marshmallow fruit salad or the green bean casserole. We want the feast to be memorable, but also what I’ll call memory-ful. One dish that always made Thanksgiving for me was my mom’s stuffing. Those flavors connected the celebration, family, and foods from year to year. However, in my own cooking, I have recently grown weary of the task of making sure the stuffing in the bird reaches a safe temperature. And not being much of a talent in the turkey-roasting department, I’ve grown to prefer cooking the turkey and stuffing separately, where they each cook faster and can be monitored more easily. However, creating a dressing (cooked outside the bird) that stayed true to the delicious memory had challenges, too. Often dressings bake up dry and sometimes bitter or harsh. To avoid that, it took some tinkering with my mom’s basic ingredients of bread cubes, rice, butter, onion, celery, and seasonings as well as with how to bake what would now be a casserole. The first key to getting clean, fresh flavor here was starting with a blank canvas—plain bread cubes. I bought some pre-made from my local grocery store bakery but you can also toast your own or buy a packaged brand. From there, a blend of wild and brown rice (such as Lundberg brand’s Wild Blend) adds a contrasting texture and earthy flavor. Using two eggs and generous amounts of good-quality stock (aim for organic low-sodium if not using homemade) plus any turkey pan drippings you can spare deliver the moisture and more flavor, which also gets a boost from a generous application of homemade poultry seasoning. Yes, homemade poultry seasoning. It indeed made a huge difference in the flavor and it takes just minutes to make—and both these aspects made me very happy. You might already have most of the ingredients for it in your spice cabinet, but if not, many are available in small containers. Grind them together using a pestle or a food processor, and that’s it. You can make the seasoning ahead, and there will be some leftover that you can use for your turkey. Speaking of making in advance, the three magic words for holiday dishes, this dressing can be assembled and refrigerated for a few hours until ready to bake. Then it just takes about 30 minutes, so you can pop it in when the turkey comes out to rest. A quick aside about salt—you will get plenty of sodium if you use store-bought stocks or broths, plus if you are roasting a kosher or brined turkey, the drippings could also be somewhat salty. I ended up not adding much salt to my dressing, but you can add more to the recipe depending on your taste preferences and ingredients. The beauty of stuffings and dressings is that they also hold up pretty well to additions or substitutions. You can use this recipe as a starting point, then add those chestnuts if it wouldn’t be dressing to you without them. Use vegetable stock and olive oil for a vegetarian version. Throw in some dried cranberries if dried fruit is a must. Back to my version. When I thought I finally had it down, I presented a small plate of my latest test run to the ultimate judge. She gave it two thumbs up, and even took home some leftovers (thanks, Mom!). 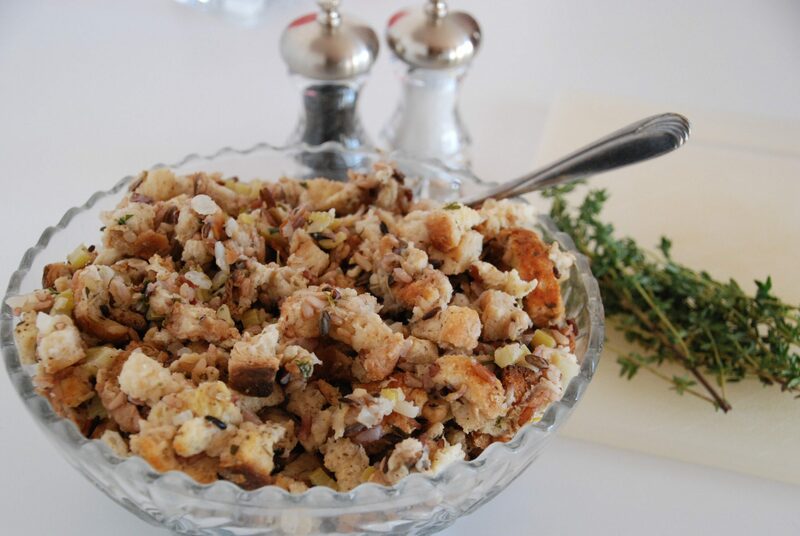 And so starting this year, this stuffing/dressing takes its place at our Thanksgiving table. Best wishes to all for a memorable and memory-ful holiday feast! True to the title in flavor but not in terminology, this recipe is technically my mom’s stuffing turned into a dressing, which is cooked outside the turkey. Aiming for stuffing consistency, I make this very moist with a combination of stock and, if you have them, pan juices from your roast turkey. Using a mix of wild and brown rice offers chewiness and earthy flavor (and you can cook the rice a day or two in advance). If you are not observing kosher rules, you can use butter instead of margarine or olive oil for greasing the pan and topping the dressing. Coat a 9 x 13 glass baking dish liberally (so the dressing won’t stick) with margarine or olive oil and set aside. Preheat oven to 375 degrees. Heat a layer of olive oil in large nonstick skillet. When hot, add celery and onion, season lightly with salt and pepper, and cook stirring frequently until softened. Add the rice and wine, and cook until most of the wine boils off. Add to a large bowl with the bread cubes. Stir in the eggs. Stir in poultry seasoning, parsley, and pan drippings, and then add chicken or turkey stock in small increments to make a very moist mixture—the cubes should be well soaked but not falling apart. Transfer to prepared baking dish and lightly press down. Drizzle a little more stock over top and down the sides, then do the same with the melted margarine or olive oil. Cover tightly with nonstick or oiled regular aluminum foil and press lightly down so the foil contacts the top of the dressing. At this point, you can refrigerate the dressing a few hours until ready to bake. Bake about 35 minutes, until the dressing registers at least 165 degrees on an instant-read thermometer. If you prefer a browned and slightly crusty top, uncover during last 10 minutes of baking. Store in an airtight container. Makes 5¼ teaspoons seasoning.